Farrar, Straus and Giroux, 9780374103620, 208pp. One summer, a young woman travels with her lover to the isolated tobacco farm he has inherited after his family dies in a terrible accident. As Orren works to save his family farm from drought, Aloma struggles with the loneliness of farm life and must find her way in a combative, erotically-charged relationship with a grieving, taciturn man. A budding friendship with a handsome and dynamic young preacher further complicates her growing sense of dissatisfaction. As she considers whether to stay with Orren or to leave, she grapples with the finality of loss and death, and the eternal question of whether it is better to fight for freedom or submit to love. 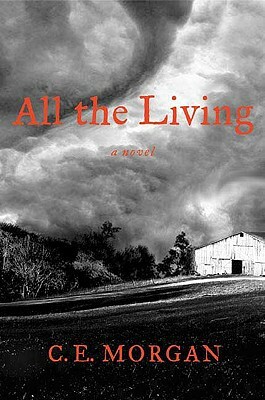 All the Living has the timeless quality of a parable, but is also a perfect evocation of a time and place, a portrait of both age-old conflicts and modern life. It is an ode to the starve-acre Southern farm, the mountain landscape, and difficult love. In her lyrical and moving debut novel, C.E. Morgan recalls both the serenity of Marilynne Robinson and the shifting emotional currents and unashamed eroticism of James Salter. It is an unforgettable book from a major new voice.